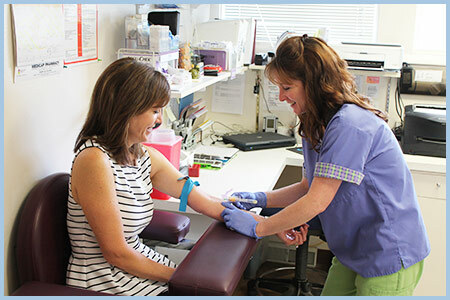 The Frontier Family Medicine Lab is a moderate-complexity approved laboratory conveniently located within the clinic. It is our goal to provide high quality and personalized service to each and every one of our patients. Our lab is directed by an on-site physician, and managed by a certified medical technologist with 10+ years of experience to ensure that all results are accurate, reliable and timely. FFM lab holds a CLIA Certificate of Compliance for the following specialties: bacteriology, mycology, parasitology, routine chemistry, urinalysis, endocrinology and hematology. Reference Laboratory: Regional West Laboratory Services of Scottsbluff, Nebraska Provides overnight turn around time on most tests. When your physician orders fasting lab work, it means NO FOOD or FLUIDS other than water for 12 hours. Take all medications unless instructed to do so otherwise by the physician. Water is allowed and encouraged. If you have questions regarding the requirements for fasting, call the lab. Some exceptions to this time frame may be made for certain health conditions (i.e. diabetics), and will be determined by your individual physician. You have been given a collection kit which will help you collect a stool specimen. This kit consists of 1, 2 or 3 vials. The liquids are POISONOUS! Don't drink them, and keep them out of reach of children! The stool should be placed into a clean, dry container. A clean margarine tub, clean wide-mouthed jar, or a clean cool whip container can also be used. Open the vial containing the liquid. Place small scoopfuls of stool into the vial until the contents rise to the red line. If the stool is formed, please try to obtain small sample amounts from each end and the middle of the sample. Mix the contents of the tube with the spoon, then twist the cap tightly closed and shake the tube vigorously until the contents are well mixed. Store all vials at room temperature unless otherwise instructed. Check all caps to be certain they are tightly closed. Label each specimen vial with name, date and time of collection, and the specimen consistency. Wash your hands thoroughly. Specimens have a generous time frame of stability once in transcaddies. Return specimen to Frontier Family Medicine lab during business hours. Contact lab prior to collection for 24 hour container. Empty bladder at the beginning of the 24 hour period and discard urine. Save all voided urine during the next 24 hour period. At the end of the 24 hours, empty bladder and add this to the specimen. Keep collected urine on ice or in the refrigerator. If the container is full before the end of the 24 hours, please contact the lab for an additional container, or place in another clean, leak-proof container. After 24 hour collection is complete, bring the container(s) to the lab during business hours. Require appointments. Depending on the type of glucose tolerance test, fasting may be required. Check with the lab personnel when scheduling appointment. Fresh specimens are required for accurate results. Urine must be collected in a sterile container for culture purposes. These containers will be supplied by lab. Midstream, clean catch specimens will be required. Instructions on this collection procedure will be given by the lab technician. Randomly voided and self-catheterization are acceptable sources of urine, but please notify the technician of these collection sources. Urine samples must be dropped off within one hour of collection and during normal lab business hours. If not possible, urines may be refrigerated up to 4 hours prior to processing. Samples older than 4 hours will be rejected.